In my last post on 29 September 2015 I described how the Concar family became established in Stafford and I finished by looking at the troubled and short life of Patrick and Bridget Concar’s son Martin. Martin was not their only son to die young. Their first born, Thomas, was only 23 years old when he died in 1880, and infantile and early death continued to stalk the family as it did for most others in the nineteenth century. The Concars’ seven other children had much longer lives, however, and scores of people are around today who are, through them, descended from the initial partnership of Patrick and Bridget that started in Stafford in 1854. In this post I want to trace the outline of what happened to the rest of the family. You can follow this on the outline family tree below. Patrick and Bridget’s second child, John (b. 1858), left his labouring father’s background and got a job as an attendant in the County Lunatic Asylum. In 1887 he married a Stafford Protestant girl, Sarah Ann Hall, and they had two surviving children, Isabel Lucy and John Henry. The latter was born in 1891 and began work as a turner in Stafford’s engineering industry. He served with the Royal Engineers during the Great War. This branch of the Concar family aspired to ‘lace curtain’ respectability and they first lived in Tixall Road, a much more desirable area than New Street. By 1911 they had moved to the often-favoured address of aspirant middle class Staffordians, Corporation Street. Both father and son were involved in local sport. They subsequently seem to have moved to Stoke on Trent. Patrick and Bridget’s fourth son, James (b. 1861), rather went the way of Martin in his earlier years. He got into trouble for drunkenness, assault and fighting. Nevertheless, he got into Stafford’s core industry, the shoe trade and, like many shoe workers, moved about in search of work. He married Mary Ann Bradnock in the early 1880s. She was born in Birmingham and it is possible James Concar was working there when he met her. The couple had ten children, of whom four were born in the shoe town of Northampton where they lived between 1889 and 1894. They returned to Stafford around 1895 and by 1901 were living in the gloomy surroundings of Pilgrim Street. Later the family lived in the South Walls area and there are numerous descendants. Patrick and Bridget Concar’s fifth child, Mary, was born in 1863. In 1886 she married Henry Stanton, a Protestant Staffordian shoemaker, and the couple had eight children of whom six survived childhood. Their base became Friar Street, a respectable enough location in the heart of Stafford’s shoemaking north end, but Henry died in 1912 and Mary in 1914. Their son Jack was then only twelve, so he must have been taken in by siblings. There are, nevertheless, numerous descendants from this line of the family. Edward Concar (b. 1865), the sixth child, went into the shoe trade and also married a Protestant , Harriet Sabin, the daughter of a railway platelayer. The couple had ten children of whom seven survived. Around 1890 they had a spell in Northampton but they returned to Stafford and in 1911 they were living in Whittome’s Buildings, a small terrace in Cross Street in the north end. In the same year they moved to Leicester where Harriet died in 1912; Edward died there in 1936. The children seem to have come and gone between Leicester and Stafford but most ultimately stayed in Stafford and extended the family line in the town. William Concar, the seventh child, was born around 1868, though his precise birth date has not been traced. He had a spell in Stafford’s growing engineering industry and in 1890 was an engineer at Dormans. In that year he was found guilty of assaulting a policeman. It was said that he, along with other men, had been rescuing a man from police custody. William’s excuse was that he was trying to get his brother into his mother’s house without further disturbance, but the magistrates didn’t believe it and fined him 2s 6d or seven days prison. William was still living at home when this incident occurred but we don’t know which brother he was supposedly helping. The incident clearly indicates continuing links with his siblings, however. He doesn’t seem to have made a go of engineering and by 1901 was back in the shoe trade as a packer, a low grade job that he was still doing in 1911. 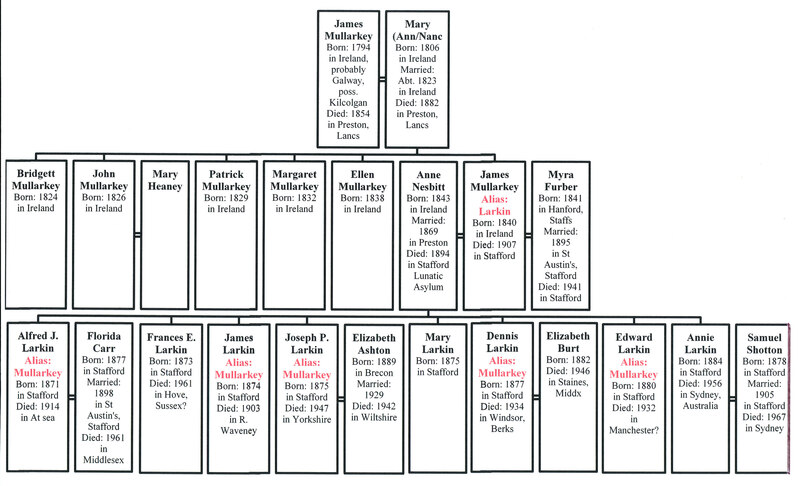 In 1894 he had married a Protestant woman, Julia Bickley, but they had no children and, unusually for the Concars, this branch of the family died out. Ellen Concar (b. 1870) did have descendants. In 1890 she also married a Protestant, Richard Hodson. He worked as a putter up, a fairly menial job in the shoe trade. In 1911 Ellen was living in Cramer Street in Forebridge with her six surviving children but her husband was not in the household. Instead, he was boarding at the Star Inn in Mill Street which suggests their marriage had problems. The fact that Ellen was working as a charwoman also indicates a household in poverty and stress. There will, however, be many descendants from this line of the Concar family. Patrick and Bridget’s final child, Annie (b. 1872), would not have known her father since he died when she was less than two years old. She had a troubled existence. She failed to get into any of Stafford’s growth industries and in 1891 was described as a ‘domestic’. She was still a charwoman in 1897 but by then she was living in London with two illegitimate children, Edward (b. 1894 in Shoreditch) and Thomas (b. 1896). We know this because on 6 August 1897 she was admitted to the Whitechapel Poor Law Infirmary and was registered as living in a shelter in Hanbury Street, Spitalfields. She and the children survived the measles and then moved to Northampton where she got pregnant again. Poor Edward seems to have been placed with relatives in Leicestershire. Certainly, in 1911 he was living, as ‘nephew’, with the Ralley family in Syston and was working as a farm labourer. He seems to have lived in that area for the rest of his life and died there in 1978. In February 1898 Annie brought baby Thomas to Stafford and dumped him on her mother. Bridget by this time was nearly seventy and living in poverty on outdoor relief. She was in no fit state to look after the child and took him to the Workhouse where he remained for six months. Bridget finally died on 9 September 1898, at which point Annie was brought back to Stafford and charged with deserting her child and leaving him a charge on the Poor Law Union. In court with a new one-month old baby in her arms, she said she was going back to Northampton to marry the father. She got one month in prison, however, after which she stayed in Stafford. Baby Violet lived less than a year, but Annie had another illegitimate child (also named Violet) in 1903. In 1908, when Violet started at St Patrick’s School, the poor kid was living in the Workhouse, presumably with her mother. Annie later seems to have moved to Birmingham where she married a Thomas Lilley in 1916. It is not known what happened to them subsequently. The sad coda on the lives of Bridget, Annie and Violet Concar is significant for what it says about the nature of the Concar family by the turn of the twentieth century. Family ties and obligations in the extended family were weak. There were dozens of relatives around Stafford in 1898, but none of them seems to have helped Bridget in her miserable final year. What determined the family’s experiences in Stafford? Like many others, the Concars were Famine immigrants to Stafford but, unlike many arrivals from that time, they ultimately put down deep roots in the town. Patrick Concar’s earlier life in an oppressed community, on the fringes of physical-force activism and during the sufferings of the Famine could have made him resentful of the British ruling class, fiercely independent and with continuing activism in response to Ireland’s troubles. Yet we see no evidence of these attitudes in his behaviour in Stafford. He married Bridget Kenney and the couple then lived a modest, quiet life in the town. They seem to have sought relative anonymity. Though close to other Irish families in New Street and Snow’s Yard, in the first two decades there is no evidence of them being involved in the drunken violence endemic to that locality. The Concar family had rather more problems with the second generation born in Stafford. The children must have had ambivalent identities. Growing up in the town and with local accents, we have seen that they were still perceived by some outsiders as ‘Irish’. The family was undoubtedly poor and Patrick’s death made things much worse. It coincided with the start of some typically teenage deviant behaviour. Bridget must have had real problems controlling her children, and she seems to have received no help from the Catholic Church. She perhaps never sought it, but the snobby Catholics at St Austin’s almost certainly looked down on this poor ‘Irish’ family that had no aspirations to join the Church’s social respectability. Indeed, Bridget Concar had at least one dispute with the Church. In 1880 she claimed that her children had been excluded from St Austin’s School because they had not brought the money to pay extra fees demanded by the School that were beyond those stipulated by the Stafford School Board. The priest ‘conferred’ with the school managers and reported that ‘the statement made was absolutely devoid of truth as the children were not sent home for any reason whatever.’ It is impossible to know what really happened but the incident shows there was no love lost between the Concars, the School and the Church. The Concars’ adherence to the Church was limited. For many in the burgeoning family it was nominal, restricted to commemorating life’s key events and attending Catholic schools. They took no part in the Church’s social life and they mostly seem to have rejected the ‘lace curtain’ pretensions of parish activists. Although some descendants married in Catholic ceremonies, others did not and it is remarkable that all of Patrick and Bridget’s children married (nominal) Protestants. The Concars were, in other words, the sort of family in danger of ‘leaking’ from the Church. Although there were subsequent unions with Stafford Catholic families such as the Dales and Elsmores, no Concars ever married into other Irish immigrant families. This emphasises their rapid integration into the Stafford working class. That integration was helped by descendants finding work in Stafford’s main industries and generally showing modest upward occupational mobility. Despite what the local newspaper said, the family’s Irish identity weakened rapidly. When Bridget died in 1898 the Famine generation and its trauma disappeared from the family. Continuing identification with an Irish heritage was very much a matter of individual decision rather than family pressure. Indeed, individuality was one of the emerging characteristics in the expanding Concar family. 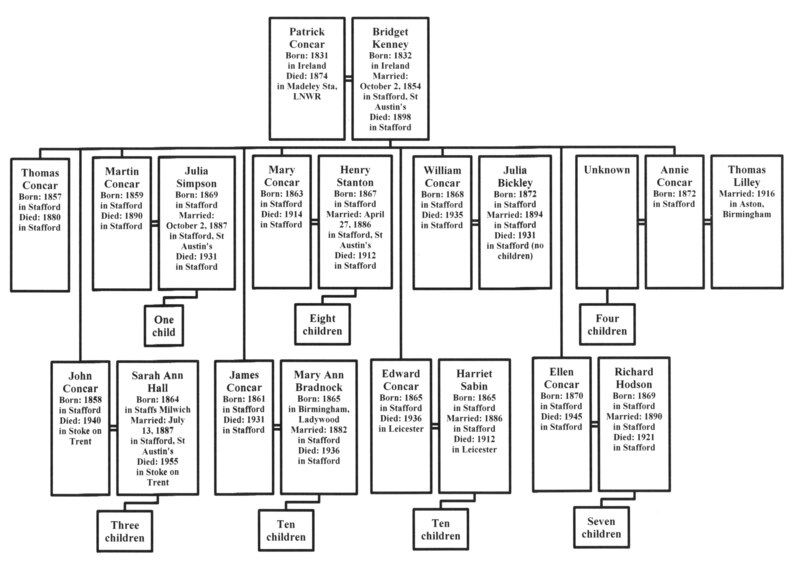 Patrick and Bridget’s nine children ultimately went their separate ways and there appears to have been little contact or kinship amongst their descendants, even those living in Stafford. By the second half of the twentieth century the various branches of the family had fanned out into local society and beyond. Patrick Concar and Bridget Kenney had indeed founded a remarkable dynasty. In the course of their lives, through their work, their social life and their marriages, their descendants slipped into the world of Stafford’s working class and emerged in the twentieth century as a generally aspirant but scattered family. They had a substantial Irish heritage but by then little conscious Irish identity. SA, 13 January 1877; 15 March 1879; 11 August 1883; 8 October 1887. By 1902 he had had 25 previous convictions for drunkenness and related offences; SA, 15 February 1902. Stepney Poor Law Union, Whitechapel Infirmary Admission and Discharge Book No.28, entries 1649-51, Ancestry database accessed 12 October 2015. Leicestershire Central RD, deaths December 1978, Edward George Concar, 6/1555. SA, 1t October 1898; St Patrick’s School Admissions Register, 3 November 1908. Aston RD, marriages, January-March 1916, Annie Concar and Thomas Lilley, 6d/688; Andrews Newspaper Index Cards, 1790-1976, references to the death of Violet May Phillips née Concar, 16 July 1960, and her mother Annie Concar. Ancestry database, accessed 12 October 2015. John Herson, ‘The English, the Irish and the Catholic Church in Stafford, 1791-1923’, Midland Catholic History, No. 14 (2007), pp. 32-36. Family memory was that Joseph Concar (b. 1922), one of Thomas’s sons, emphasised his Irish heritage but that he was an exception. These comments are based on contacts and interviews with a number of descendants but others may, of course, disagree. I hope they contact me!